Structured product, also known as a market-linked investment, is a pre-packaged investment strategy designed to give customized risk-return. This is accomplished by taking a traditional security, such as an investment-grade bond or a CD, and replacing the interest payment with a payoff based on the performance of one or more underlying assets. These products were available, until recently, only to institutional investors or with very high minimums. They are excellent asset management tools. They allow an investor market exposure with downside protection or leveraged exposure to the market. 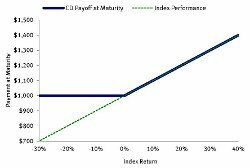 Most structured investments are for a fixed term (like a CD, with varying levels of protection from loss, and exposure to the return of an index). Three basic structured investment categories are: principal protected, buffered return enhanced notes and return enhanced notes. If at maturity the underlying index is up (higher than when it was purchased), the investor receives 100% of the principal plus that gain. If the market is down at maturity, the investor receives 100% of the principal. For example, if you purchase $1,000 of a Market-Linked CD and the underlying index is the S&P 500 and in 7 years the S&P 500 is 70% higher than it was when you purchased the Market-Linked CD, then you would receive $1,700. If the S&P 500 lost 40% during those 7 years, you would receive $1,000 at maturity. No interest or dividends are paid. In the case of Market-Linked CDs, the principal is protected by a CD that is FDIC insured. If the investor would like to sell the note before maturity, there is a secondary market (you can sell them before maturity) but due to the highly customized nature of the investment the marketed is limited. Structured notes are more popular in Europe but are fairly new in the US. A secondary market may develop over time. So be ready to hold the note until maturity. 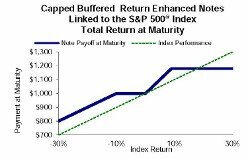 Buffered Return Enhanced Notes offer participation in an index with a varying amount of downside protection. Another option is a buffered note. This is a 2 year capped buffered note linked to the S&P 500. Currently (1/2016), the down side is protected by 10%. So if the S&P 500 is down by 10% in 2 years, you get your money back. If it’s down by more (like 15%) you lose 10% less than the fund (5% if the S&P is down 15%). On the upside, the return is doubled up to a cap. Currently (1/2016) the cap is 18%. So if the index is up by 9% or less, the return is doubled. Note that the standard deviation for the S&P 500 over the past two years is about 10%; hence, 67% of the time the S&P 500 will be in the range of the buffer or increased return. No interest or dividends are paid. The return may be uncapped. As with the Market-Linked CDs, Buffered Return Notes are linked to various indices. The standard deviation of the S&P 500 over the last two years is about 10% with an average return of about 5%. So there is about a 67% chance that return will be between 15% and -5% return. Hence, there is a good likelyhood that in two years an investor will be completely protected from the downside or get a boost on the upside. But note that about 1/3 of the time the could be some loss (although 10% less than just holding the index) or the return will be more that the cap. The same option is available linking to small US stock index (Russell 2000), developed foreign stock index, emerging market index, and many others. Another option includes a 4 year buffered note that is not capped. The downside buffer currently (1/2016) is 20% and the upside is uncapped 1.1 times the gain in 4 years. Return Enhanced Notes offer no downside protection but an increased return. For example, a 2 year note linked to the S&P 500 will pay 1.5 times the positive return, if the S&P 500 is up at maturity. If the S&P 500 is down, the investor takes to loss. The options change and interest rates change. With higher interest rates, better options existing. There are many other options. This podcast is for informational use only. This is not an appropriate investment for everyone. As with any investment, please read the prospectus and discuss it with your financial planner. Another consideration is pricing transparency. There is no uniform standard for pricing, making it harder to compare the net-of-pricing attractiveness of alternative structured product offerings than it is, for instance, to compare the net expense ratios of different mutual funds or commissions among broker-dealers . Many structured product issuers work the pricing into their option models so that there is no explicit fee or other expense to the investor. On the flip side, this means that the investor can’t know for sure what the implicit costs are. 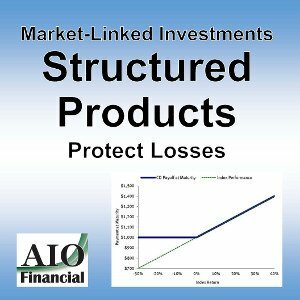 As we know that Structured product also known as a market-linked investment. Its a pre-packaged investment strategy based on a derivatives, single security, a basket of securities, options, commodities, foreign currencies, and to a lesser extent, structured products that are sold have ‘principal protection’and also return linked to Equity without risk on principal. Structured products are designed to facilitate highly customise risk-return objectives. Structured products can also be designed to provide positive returns. Structured product are investment solutions created to adapt to the needs of the investor – such as risk and return profile, liquidity requirements, and the amount to be invested – while also enabling a wide range of asset classes for investing with options for redemption. Therefore, structured products provide tailor-made solutions in line with a specific strategy for all market configurations and are sophisticated in nature.